Reading and share top 30 famous quotes and sayings about Shorthand by famous authors and people. Browse top 30 famous quotes and sayings about Shorthand by most favorite authors. 2. "I loved those Latin words for their dignity, their foreignness, and the way my tongue had to wrap around them. I felt that in learning the special language of a scholarly order, I was amassing a kind of force. This was the pure and noble side of the world, uncorrupted by secrets and trickery. How extraordinary that a word could serve as a shorthand for an elaborate tale of disease." 3. "(1) Use mathematics as shorthand language, rather than as an engine of inquiry. (2) Keep to them till you have done. (3) Translate into English. (4) Then illustrate by examples that are important in real life (5) Burn the mathematics. (6) If you can't succeed in 4, burn 3. This I do often." 4. "By the 1920s if you wanted to work behind a lunch counter you needed to know that 'Noah's boy' was a slice of ham (since Ham was one of Noah's sons) and that 'burn one' or 'grease spot' designated a hamburger. 'He'll take a chance' or 'clean the kitchen' meant an order of hash, 'Adam and Eve on a raft' was two poached eggs on toast, 'cats' eyes' was tapioca pudding, 'bird seed' was cereal, 'whistleberries' were baked beans, and 'dough well done with cow to cover' was the somewhat labored way of calling for an order of toast and butter. Food that had been waiting too long was said to be 'growing a beard'. Many of these shorthand terms have since entered the mainstream, notably BLT for a bacon, lettuce, and tomato sandwich, 'over easy' and 'sunny side up' in respect of eggs, and 'hold' as in 'hold the mayo'." 5. "Growing up in a family of actors, what's great about it is that they're very supportive and they understand what it's like to be an actor - the rejections, the highs and lows... and having a common language with them is great because you have shorthand speech." 7. "My shorthand answer is that I try to write the kind of book that I would like to read. If I can make it clear and interesting and compelling to me, then I hope maybe it will be for the reader." 8. "You work enough with someone and you develop a shorthand. You know how he likes to work through the day and he knows where you're vulnerable and where your weaknesses and strengths are, so it makes for a good team, a team that knows who's over there behind your back." 10. "You can't read my shorthand because I wrote in Polish." 11. "A friend of mine tells that I talk in shorthand and then smudge it." 12. "A chief petty officer taught me shorthand, which got me promoted to yeoman first class." 13. "To say exactly what one means, even to one's own private satisfaction, is difficult. To say exactly what one means and to involve another person is harder still. Communication between you and me relies on assumptions, associations, commonalities and a kind of agreed shorthand, which no-one could precisely define but which everyone would admit exists. That is one reason why it is an effort to have a proper conversation in a foreign language. Even if I am quite fluent, even if I understand the dictionary definitions of words and phrases, I cannot rely on a shorthand with the other party, whose habit of mind is subtly different from my own. Nevertheless, all of us know of times when we have not been able to communicate in words a deep emotion and yet we know we have been understood. This can happen in the most foreign of foreign parts and it can happen in our own homes. It would seem that for most of us, most of the time, communication depends on more than words." 14. "My mother and Joe have a lovers' shorthand, an economy of gestures that comes when you are close enough to someone to speak their language. I wonder if my mother and father ever had that, or if my mother was always just trying to decipher him." 15. "There's shorthand that happens when you work with someone you know where you can almost finish each other's sentences. There's just a certain back and forth that becomes much easier with someone you've worked with for so long." 16. "I won't make shorthand films, because I don't want to manipulate audiences into assuming quick, manufactured truths." 17. "But gossip must see its characters in black and white, equip them with sins and motives easily conveyed in the shorthand of conversation." 18. "In the middle of his rapid-fire dictatioin he said softly, without pausing, "When the sun is on your hair, it shines like spun gold," and launched back into his letter. Lauren, who had inadvertently taken half of the compliment down in shorthand, gave him a killing glance, and he chuckled." 19. "Music is the shorthand of emotion." 20. "When you play the same character for a long time, you have a shorthand. You get onto the set, you put on your outfit and two-thirds of your work is done because you've built on that work for so many years." 21. "Dad always warned that it was misleading when one imagined people, when one sas them in the Mind's Eye, because one never remembered them as they really were, with as many inconsistencies as there were hairs on a human head (100,000 to 200,000). Instead, the mind used a lazy shorthand, smoothed the person over into their most dominating characteristic--their pessimism or insecurity (something really being lazy, turning them into either Nice or Mean)--and one made the mistake of judging them from this basis alone and risked, on a subsequent encounter, being dangerously surprised." 22. "Imagine a poem written with such enormous three-dimensional words that we had to invent a smaller word to reference each of the big ones; that we had to rewrite the whole thing in shorthand, smashing it into two dimensions, just to talk about it. Or don't imagine it. Look outside. Human language is our attempt at navigating God's language; it is us running between the lines of His epic, climbing on the vowels and building houses out of the consonants." 23. "No, I mean, this is a problem that most people have. A problem of the human condition. We get ahold of some kind of shorthand in understanding people, and we think it works, and we use it to assess, categorize, and then, very often, dismiss people. It's the basis for stereotyping, profiling, and several other very sorry words that end in i-n-g."
24. "The sketch hunter moves through life as he finds it, not passing negligently the things he loves, but stopping to know them, and to note them down in the shorthand of his sketchbook." 25. "I'm always disappointed when I see the word 'Puritan' tossed around as shorthand for a bunch of generic, boring, stupid, judgmental killjoys. Because to me, they are very specific, fascinating, sometimes brilliant, judgmental killjoys who rarely agreed on anything except that Catholics are going to Hell." 26. "We had to keep explaining things, backtracking and filling gaps. We realised our own conversations had evolved into a kind of shorthand, a tidy, neat little minimalism. Covering the whole canvas in broad obvious brushstrokes for outsiders felt like a waste of sounds, time and effort. Speaking with footnotes." 27. 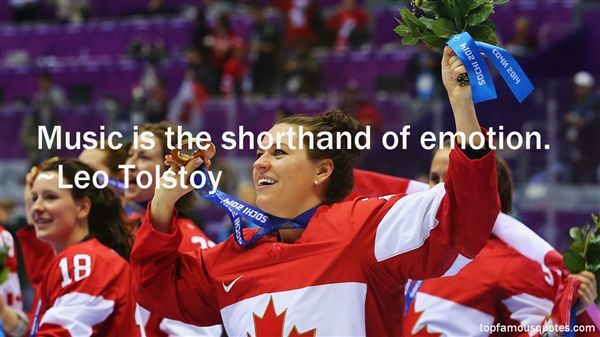 "I didn't know shorthand either.This meant I couldn't get a good job after college. 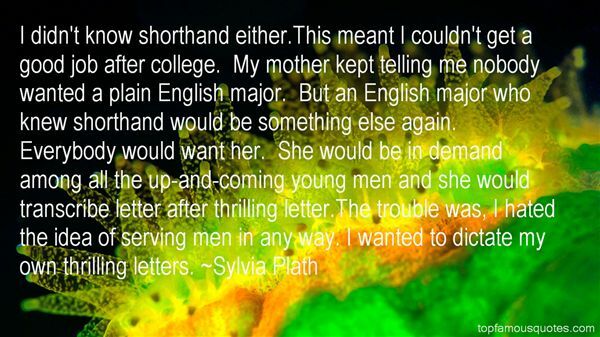 My mother kept telling me nobody wanted a plain English major. But an English major who knew shorthand would be something else again. Everybody would want her. She would be in demand among all the up-and-coming young men and she would transcribe letter after thrilling letter.The trouble was, I hated the idea of serving men in any way. I wanted to dictate my own thrilling letters." 28. "Your voice is the wildest thing you own," Brooke says to me. "And you're giving it away. You can't see it. Your obsession is blinding you." He is angry. He is talking in shorthand. "You're losing yourself." 29. "What of Thought? The Crew had developed a kind of shorthand whereby they could set forth any visions that might come their way. Conversations at the Spoon had become little more than proper nouns, literary allusions, critical or philosophical terms linked in certain ways. Depending on how you arranged the building blocks at your disposal, you were smart or stupid. Depending on how others reacted they were In or Out. The number of blocks, however, was finite. "Mathematically, boy," he told himself, "if nobody else original comes along, they're bound to run out of arrangements someday. What then?" What indeed. This sort of arranging and rearranging was Decadence, but the exhaustion of all possible permutations and combinations was death.It scared Eigenvalue, sometimes. He would go in back and look at the set of dentures. Teeth and metals endure." 30. "I find I like to work with a lot of the same actors, because I find that there's sort of shorthand there, and there is this unspoken trust, both ways. They trust me and I trust them. And I know what I'm going to get from them, to an extent. It's just fun, kind of creating this little family."